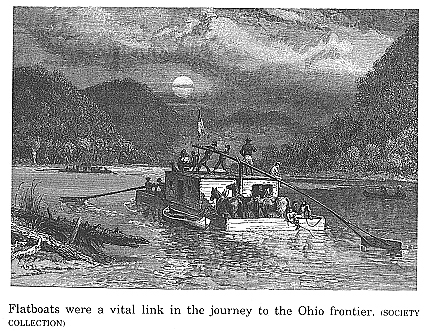 Ohio frontier during the last few years of the eighteenth century. historian category of the Ohio Historical Society's recent essay contest. referred to as Pioneer Settlers. land, 1886), 110, hereafter referred to as Rufus Putnam. referred to as Washington County, Ohio. development of the first permanent settlement in the Ohio Country. usually took eight to ten weeks for small wagon parties to complete. Ohio Historical Society, Columbus, Ohio. provide this most necessary article of clothing for her family. And so it was. hole made in the side of the boat for dipping up water and placed in a canoe. zine, New Series XVI (April, 1897), 215.
tled land beyond the mountains. conditions and thus returned to New England. watched for the arrival of the mailboat in Marietta. if I could make you a visit this afternoon, but I must think no more of this. Hard work and frequency of childbirth took their toll of women. portive role in the advancement of the western frontier. 12. Byron H. Walker, Frontier Ohio (Columbus, 1972), 100. 13. R. Carlyle Buley, The Old Northwest: Pioneer Period 1815-1840, 2 Vols. (Bloomington, Indiana, 1951), I, 309-10, hereafter referred to as The Old Northwest. 14. Ibid., 309, and "76 Life Ceaseless Laboring," The Advocate, 4 August 1976, 9.
to as a "cabin raising" and was usually accomplished in one day. Some of these cabins were about as primitive as the lean-tos. The cabin had a roof but no door shutter and no chinking nor daubing. two other travelers came in also. So we all lay on the floor the best we could. house, were made as the family grew and money became available. 15. Washington County, Ohio, 51; Buley, The Old Northwest, I, 142-43.
torical Publications, XIX (1910), 206.
which were more than simply shelters against the weather. Anna Strong was a young bride on the northern frontier in 1804. Spring of The Year 1803 (Boston, 1805), 122-23. 18. Curtis, "Recollections of Pioneer Life." script 55, Ohio Historical Society. children had been instructed to hurry to one of the blockhouses. 20. Stone, "From Rutland to Marietta," 220. 23. Buley, The Old Northwest, I, 209-10. 24. Curtis, "Recollections of Pioneer Life." ants, in the First Settlements of Ohio," The Medical Counselor ( 12 January 1856), 34. 26. Buley, The Old Northwest, I, 210. Valley, Localized History Series (New York, 1966), 21. 28. Curtis, "Recollections of Pioneer Life." 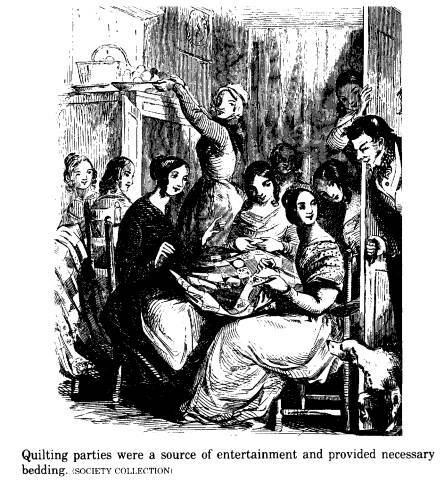 thus frontier women were often hard pressed to feed their families. to survive the hardships of the "famine of 1790-the starving year,"
29. Stone, "From Rutland to Marietta," 220. 31. Barker, First Settlement of Ohio, 61. 32. Hildreth, Pioneer History, 265-66.
certainly one of the most important was that of "family healer." return unharmed from the field or their children from work or play. hood," Medical Repository, VI (February, March, and April, 1809), 359.
another and were all enclosed within the outside walls of the fort. sanitation were not conducive to good mental or physical health. farming, household chores, and caring for the younger children. 34. Edmund Cone Brush, "The Pioneer Physicians of the Muskingum Valley,"
in the new frontier settlement. was located directly across the Muskingum River from Marietta. Dr.
36. Sears, "Pioneer-Indian Days in Ohio," 363. 37. Hildreth, Pioneer Settlers, 323-24. 38. Washington County, Ohio, 381.
lection 210, Ohio Historical Society. probably exceeded by that of the ladies. 40. Brush, "Pioneer Physicians," 252.
have never seen a more anxious rivalry, nor a fiercer struggle." the work and fun were over. At "apple-cuttings" or "apple-parings,"
ing their mothers with domestic tasks, one young lady, Louisa St.
41. Washington County, Ohio, 358.
educator, religious instructor, weaver and tailor, and physician. 43. Ellet, The Pioneer Women of the West, 178-79.